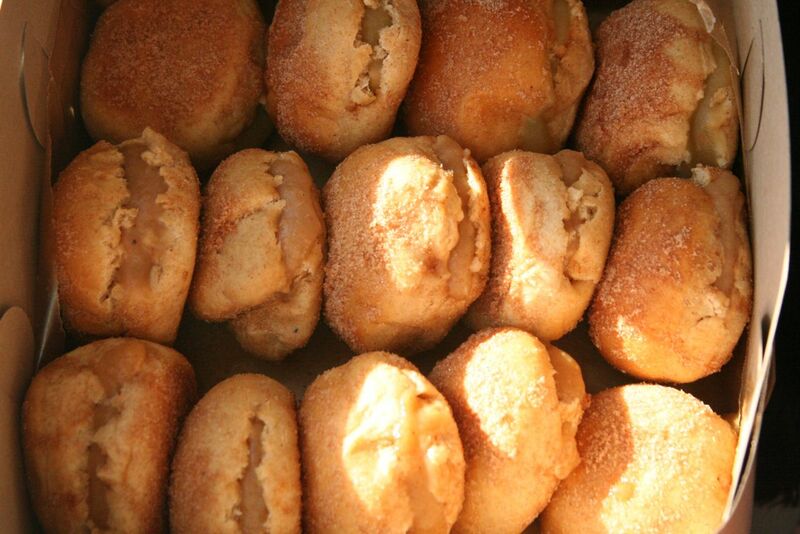 For years now, Chanuka has been synonymous with doughnuts. While gentiles are stringing up their lights, saddling up reindeer, and racking up huge electricity bills, we Jews are probably more focused on our usual preoccupation: food. Yes – miracles and wonders, olive oil, lights, transcending the physical too, but mainly food – deep fried food. We’re imaging the crispy and salty latkes and the moist creamy doughnuts. Many years ago, some clever person had the great idea to connect every single Jewish holiday to different foods, and these foods have become rituals in their own right. The whole idea at it’s core is pure outreach (so I guess a Lubavitcher thought of it? ): the lost Jewish soul comes back to his grandparents’ Shabbos table with one good bowl of chicken soup. The only thing that really connects doughnuts with Chanuka is the fact that doughnuts are deep fried, which is supposed to remind us of the miracle of the oil in the Temple. Considering the recipe I’m about to give you is for baked doughnuts, not fried ones, which might seem sacrilege to some, let me just defend myself in advance; I would never choose to deep-fry something if I could make it just as good another way. Deep-frying is messy, costly and when it’s all over, the smell lingers, and someone needs a facial. If you’re thinking that you’d be better off just buying doughnuts, then yes, you have a point. It would be so much simpler if I could just bite into a commercial doughnut and taste good quality jam or REAL custard filling, but anyone who eats discerningly knows that most of the time, food you buy just isn’t all that great. It’s one of the big reasons I bother to cook at all (unless you thought it was the calluses and burns!). If you make your own doughnuts and fillings this year, no matter which recipe you use, let your mind wander back to the story of Chanuka, and add some personal meaning to your own recipe. Think about the heroes of the story: The Maccabim, the people that physically cleaned the desecrated Temple, and the heroine Yehudit who seduced the Syrian-Greek general Holofernes with cheese and wine before beheading him. Deep fried food? We can be more creative than that – just the same way we are probably capable of deep-frying anything, I am almost certain we are capable of attributing connection and meaning to absolutely anything. The idea of ‘transcending the physical’ stems from the fact that the miracle of Chanuka features the number 8. To explain; a 7-day week is the norm, and the bane of our existence, but the miracle of the oil burning lasted for a full eight days. Eight is not just any random number, it is just one more than seven. 8 teachers us to try and go beyond our comfort zones and our natural state of being. Directions: place 1/3 cup of the warm milk in the bowl of an electric mixer. Stir in the yeast and set aside for five minutes or so. Be sure your milk isn’t too hot or it will kill the yeast. Stir the butter and sugar into the remaining cup of warm milk and add it to the yeast mixture. With a fork, stir in the eggs, flour, nutmeg, and salt – just until the flour is incorporated. With the dough hook attachment of your mixer beat the dough for a few minutes at medium speed. This is where you are going to need to make adjustments – if your dough is overly sticky, add flour a few tablespoons at a time. Too dry? Add more milk a bit at a time. You want the dough to pull away from the sides of the mixing bowl and eventually become supple and smooth. Turn it out onto a floured counter-top, knead just a few times (the dough should be barely sticky), and shape into a ball. Transfer the dough to a buttered (or oiled) bowl, cover, put in a warm place for an hour or until the dough has roughly doubled in size. Punch down the dough and roll it out 1/2-inch thick on your floured countertop. Use an upside down small drinking glass or a 2-3 inch cookie cutter to make circles. Transfer the circles to a parchment-lined baking sheet. Cover with a clean cloth and let rise for another 45 minutes. Bake in a 375 degree oven until the bottoms are just golden, 8 to 10 minutes – start checking around 8. While the doughnuts are baking, place the butter in a bowl and the sugar and cinnamon in another bowl, plate or ziploc bag. Remove the doughnuts from the oven and using a pastry brush (or you can actually dip the doughnut into the bowl of butter) brush butter over each doughnut, then a quick toss in the sugar. Depending on how many you’re making, you can just throw all the doughnuts together in the ziploc bag and give it a shake. When I’m making a ton of these I spread the sugar mixture onto a baking tray and after brushing the butter, I turn the doughnuts around once to get coated. Makes 1 1/2 – 2 dozen medium doughnuts. 3-4 apples and/or pears, chopped (no need to peel if you plan on blending). Here’s how: add everything to a heavy-bottomed pot. (Don’t mess around with the numbers of the spices unless you have a really good memory! Remember, whatever you put in, must come out so this way you have 1, 2, 3, 4 & 5…). Add enough water to barely cover the fruit, bring to a boil, then reduce the heat to low. Stir often, keep reducing the liquid and be careful not to let it burn. Some people use a crock pot and cook the fruit overnight and you can do that, but you can also just let it bubble for as little as an hour. The longer you let it cook, the thicker it will be. When enough is enough, remove all the spices (1, 2, 3, 4!) and blend if you prefer a smoother consistency. You can preserve the fruit by doing the whole mason-jar 10 minute hot water bath but don’t bother with that right now. When the fruit has cooled, just slice ⅓ of the way through the doughnut and spread the fruit with a knife. You can also inject it like I did one year, getting very sticky hands and wasting a lot of time. Like this: put the apple juice and the ginger into a small pot and boil. Keep reducing until less than half is left. When cooled, prepare the icing by combining the sugar and cinnamon and slowly add tablespoons of the reduced apple ginger mixture. Whisk until smooth. Place a wire cooling rack over a piece of parchment paper. When doughnuts are cool, dip tops into the glaze and let them rest on a wire rack until the glaze hardens.